Its exotic looking, its yummy. 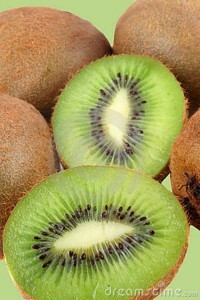 The kiwifruit is an amazing power fruit, packing in many benefits in a tight space! To start with, raw kiwi has actinidin, a protein-dissolving enzyme that helps digestion, somewhat like the papain in papaya or bromelain in pineapple. It’s brimming with potassium, that helps maintain the electrolyte-balance by countering the effects of sodium. It has a high amount of immunity-boosting Vitamin C, along with other anti-oxidants. In fact, an extraordinary combination of anti-oxidants in the kiwi helps protect the cell DNA from oxidative damage and perhaps helps prevent cancer.